About the BikeThe Brompton S2L fold up bike features Brompton's S type handlebar, the S Type is Brompton's Sleekest and most aero handlebar. The S2L comes equipped with Brompton’s super reliable and easily maintained 2 Speed systems also comes equipped with Brompton mudguards, giving you the opportunity to ride to work in most conditions without having to worry about a change of clothes. Finally, not forgetting Brompton’s super simple folding mechanism; no folding bike can fold as fast or as compact as a Brompton can. 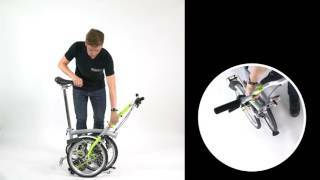 If you’re looking for a first class fold away bike, the Brompton S2L is one of the best folding bikes around today.